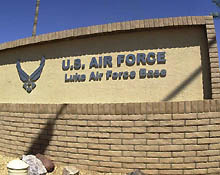 Luke Air Force Base is named for the first aviator to be awarded the Medal of Honor – 2nd Lt Frank Luke Jr. Luke’s 56th Fighter Wing was first activated on January 15, 1941, as the 56th Pursuit Group. The 56th left for England January 6, 1943. During the following two years, pilots of the 56th destroyed more enemy planes and listed more aces than any other Army Air Force group in the 8th Air Force, including the top two aces in Europe. The mission of Luke AFB is to train the world’s greatest F-16 fighter pilots and maintainers, while deploying mission ready warfighters.